Strolling into a West Seattle restaurant on a dreary November afternoon, the man himself enters nearly unnoticed. 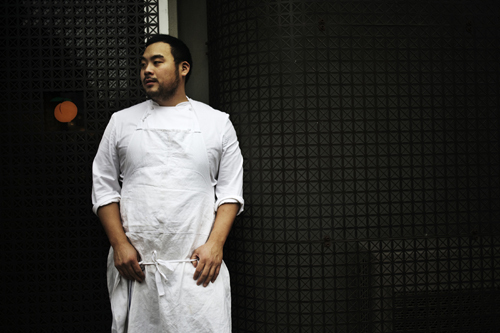 Revered in writeups and showered with culinary awards, Chef David Chang remains a humble cook, without entourage, without fanfare, and generally in a friendly state. All despite his rock star status. Local journalists and food writers trail in one by one for the media reception, while glasses of prosecco and lychee are passed about. Chang shifts uneasily from one foot to the other in his black Converse, the glass of water in his hand a possible indication of a late night. He looks much the way he did when I first met him at the 2009 Aspen Food & Wine Classic Best New Chefs dinner, save for the absent chef coat. Focused, but slightly apprehensive. Gracious, but hesitant. I introduce myself before the talk begins, prodding him as to what he’ll discuss this afternoon. “I don’t know,” he confesses with ardor.